The Can-Am All Breeds Equine Expo is Eastern Canada’s premier equine event. It brings together thousands of horse lovers and industry partners all under one roof for a great weekend. Everyone is welcome, from the seasoned horse person to the weekend rider and everything in between! 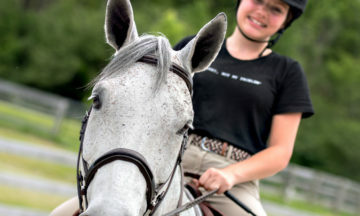 The Can-Am Equine Expo features three exciting days of international clinicians, family-fun entertainment and performances, equine breed showcases, all indoor shopping and kid-friendly interactive attractions. Ontario Equestrian (OE), is proud to once again be partnering with Can-Am to offer members a 25% discount on opening day admission and evening Extravaganza tickets. This offer is only available online and in advance of the expo. In addition to the discounted tickets, we have also partnered with Intercity Insurance to focus on recreation and trail riding initiatives at this years Can-Am. OE’s Director of Sport, Pam Coburn and Intercity’s Mike King will be hosting daily seminars at 11am, entitled “Trail Safety & Advocacy”. If you ride trails in Ontario, or simply want to know more about OE and Intercity, this is an opportunity for you to connect with our team, learn about our new initiatives and ask questions. NEW Guide for Equestrian Trail Riding booklet. FREE sample of MAAAX Equine Feed and meet a MAAAX representative. – A chance to meet an Intercity Insurance representative. – A 2018 OE Application to renew/join on-site. Should you have any further questions about the above details, please contact Brandon Hall, Marketing and Communications Manager at b.hall@ontarioequestrian.ca.